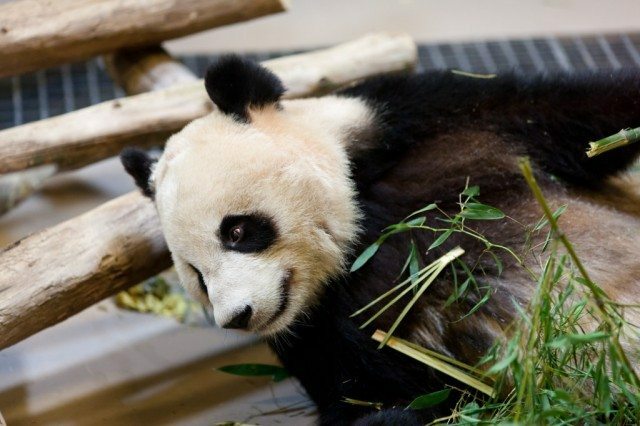 Er Shun and Da Mao, the Toronto Zoo's new pandas, are ready to meet the public. You really don't have to wok too hard when you're this cute. Er Shun, avoiding the sun. This is not the bamboo he ordered. Da Mao contemplates the meaning of it all. Da Mao searches for a change of scenery. Da Mao eating bamboo, he does a lot of this. Da Mao waves to the crowd. Er Shun is ready for her close-up. The crowd is impressed with Er Shun. She's impressed with that blue barrel. Da Mao wishes this was an actual cave. Da Mao going for a stroll. You stare and Da Mao, he stares back. Da Mao does what pandas do. Over 5,000 Toronto Zoo members, as well as members of the press, got a special sneak peak at giant pandas Er Shun and Da Mao earlier today. The pair is expected to be at the zoo, on loan from the Chinese government, for the next five years. Zoo director of public relations Katie Gray said that the day was meant as a warmup for the pandas’ official unveiling on Saturday. The pandas, for what it’s worth, were remarkably unfazed by both the crowd—which included both children and adults squealing with delight—and the dozens of cameras being pointed at them. Four year-old male Da Mao lounged in the sun, eating bamboo, sitting in a remarkably human-like posture and staring back at the crowd, while five year-old female Er Shun avoided the heat and lay sprawled out in the indoor part of her enclosure. This seemed to be more than enough for the onlookers. That’s the great thing about pandas. They don’t have to do much to impress you. They’ll spend 16 hours a day eating, reject roughly 85 per cent of the bamboo you offer them, poop roughly 40 times, then go to sleep for eight hours, and you’ll love them for it. The exhibit also features an information centre, where zoo-goers can read about pandas and their habitat, watch panda videos, and play panda-related touchscreen games. The space was designed by architecture firm Reich and Petch. Project coordinator Carolyn Smith said that the aim was to create something that was distinctly Chinese, but without resorting to cliched imagery. Overall, Gray said she was pleased with the day, both logistically and in terms of crowd response.